B.S (S.Hut.). 1995. Faculty of Forestry, Institut Pertanian Bogor (IPB). Departement of Forest Management; Major in: Honey Bee (Research Title: Location Identify for Apiculture (Apis spp.) at Cisadea-Cigombong, Cianjur, West Java. M.Si. 2005. Forestry Sciences (IPB). 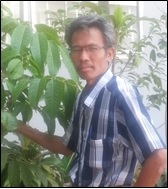 Major in Tree Improvement (Research Title: Variability of Quantitave Carachters, Isozyme and Inhibitor Trypsin Activity of Paraserianthes faltaria (L) Nielsen at several Provenance Trial in West Java). Dr. 2013. Faculty of Agriculture (UNPAD). Major in Breeding (Research Title: Genetic Variability of Sengon (Paraserianthes falcataria (L) Nielsen Provenance Trial Seed Stand Based on Morphology and RAPD Markers). Evaluation of Genetic Parameters Toona sinensis Roem Progeny Test (Yayat Hidayat, Susana P Dewi dan Sopandi Sunarya). (2014). Seedling Quality and Early Growth of Paraserianthes falcataria (L) Nielsen F-2 Half-Sib Plant in Progeny Test (Susana P Dewi dan Sopandi Sunarya). (2013). Genetic Variability, Genetic Gain and Cluster Pattern of Paraserianthes falcataria (L) Nielsen Seed Stand Population After Mass Selection based on Morphology Marker (Sopandi Sunarya, Murdaningsih, H.K., Neni Rostini dan Sumadi). (2012). Uses RAPD Marker for Estimate Genetic Diversity of Paraserianthes falcataria (L) Nielsen Progeny Following Resistence Stem Borer and Increment Selection (Neni Rostini, Sopandi Sunarya dan Farida Damayanti). (2012). Evaluation of Genetic Paraserainthes falcataria (L) Nielsen Seed Source Provenance Trial Population Following Stem Borer Selection base on Morphology Marker (Sopandi Sunarya, Neni Rostini & Farida Damayanti). (2011). Evaluation Genetic Quality of Paraserianthes falcataria (L) Nielsen Progeny of Provenance Trial Seed Source following Resistence Stem Borer and High Economic Selection based on Morphology Marker (Neni Rostini, Sopandi Sunarya & Farida Damayanti). (2011). Growth Response of Paraserianthes falcataria (L) Nielsen Seed Second Generation Against Diefferent Light Intensity (Sopandi Sunarya). (2009). Role of Sengon (Paraserianthes falcataria) genetic diversity in sustainable of community forest in java, Indonesia(Siregar UJ, Winarni, Retno, W dan S Sunarya). (2005). Arbuscular Mychorrhiza Fungi (AMF) and Media Carrier Compatibility in AMF Mass Production (Sopandi Sunarya). (2003). Seed Yield of Agathis lorantifolia in Stands Agroforestry Educational Forest Mt. Walat, Sukabumi, West Java (Sopandi Sunarya). (2003). Provision Accompaniment of Seed Source/Forest Seedling: Identification of Provision Seed Source/Forest Seedling 2015 Dinas Kehutanan West Java Province. (2015). Reviewer of Research Team Planning Research (RPTP) 2015 Balai Peneitian Teknologi Agroforestry. (2015). Reviewer of West Java Local Regulation Draft “Standardization of Setting, Dovelopment and Managament of Byo-Physyc at Protected Area” in West Java. (2013). Technical Guidance of Strategies and Techniques Arrangement of Protected Area Management at West Java Province. (2013). Valuation of Sustainable Forest Planting Management at PT INHUTANI II Unit (Semaras) South Kalimantan Province. (2013). Socialization of Protected Area Indicators-Criteria in order to Materialization West Java Green Province. (2013). Arrangement of Protected Area Indicators and Criteria in order to Materialization West Java Green Province. (2012). Field Monitoring and Valuation of “Menuju Indonesia Hijau”. (2011). Valuation of Sustainable Native Forest Effort of PT FITAMAYA ASMAPARA Central Kalimantan. (2009). Valuation of Sustainable Native Forest Management Effort of PT SUKA JAYA MAKMUR (Alas Kusumah Group) West Kalimantan. (2008). Increasing Sertificated Seed Source at KPH Sumedang Perum Perhutani Unit III West Java and Banten. (2008). Evaluation of RHL’s Planting at KPH North Bandung, BKPH West Manglayang- Perum Perhutani UNIT III West Java and Banten. (2008). Seed Source Sertification of Melia azedarach at Trenggalek-East Java. (2008). Arrangement of Reforestation Technique Design of Gerhan at West Sulawesi. (2007). Identification and Description of Production Forest that non Ownership at Riau Province. (2007). Inventory of Private Forest Potency at Cirebon District. (2007). Valuation of Sustainable of Native Forest of PT RODA MAS. (2007). Arrangement of Seeding Training Modul at BPTH Java and Madura. (2007). Valuation of Gerhan’s Seedling at BP-DAS Cimanuk-Citanduy. (2007). Arrangement of RTL-RHL sub-DAS Cikawung DAS-Cimanuk-Citanduy Cilacap District. (2007). Evaluation of Gerhan’s Palnting at Tulungagung District-East Java. (2007). Seed Source Sertification at Tasikmalaya. (2007). Seed Source Sertification at Purwodadi, Boyolali and Magelang. (2007). Seed Source Sertification of Mangrove at Cilacap-Central Java. (2007). Inventory of Surili at Mt. Papandayan, Garut-West Java. (2007). Seed Source Sertification at BKSDA West Java I (Telaga Warna, Mt. Cipancar, Mt. Takokak and Mt. Simpang). (2007). Arrangement of Forest Trees Seed Manual at BPTH Java-Madura. (2006). Identification or Mangrove Genetic Resource around Java and Madura. (2006). LPI Mampu Valuation of Effort IUPHHK PT SEGARA INDOCHEM East Kalimantan. (2006). Valuation of GNRHL’s Seedling. (2006). Increasing of Certificated Seed Source at Perum Perhutani Unit II East Java. (2006). Inventory of Genetic Resources in Cental Java. (2006). Inventory of Genetic Resources in West Java. (2005). Controlling and Valuation of Gerhan Seedling. (2005). Training of Forest Trees Genetic Conservation. (2005). Seminar of Seed Management at Private Forest. (2006). Increasing of Social Resources Around Conservation Areas. (2006). Tropical Native Forest System Silviculture in Indonesia. (2007). Training of Seed Source Sertification at BPTH Java and Madura. (2007). Training of Environmentalists Community. (2007). Increasing of Forest Comprehension by Quality Seedling Production Technique. (2007). Symphosium of RISH International LIPI-Japan. (2007). National Workshop “Space Planning based on Natural Resources Potency to Support of Sustainable Local Development Program” Research Central Geotechnology LIPI Bandung. (2009). Workshop of West Java Province Forestry Planning Arrangement 2013-2033. (2013).